Meet Your Neighbor Dottie Ray. Dottie was born in Monmouth to John (died in 1987) and Dona Williams Frazier (died August 2011). Her step-father Maurice (Red) Frazier lives in Galesburg. Her dad's parents were Howard and Mae Williams from Oquawka. Her mother's parents were Bill and Helen Christensen from Monmouth. Dottie has three sisters, Kim (Donald) Blair lives in Easton, Maryland, Jeri Barcroft lives in Monmouth, and Jona (Joel) Perrin lives in Lindenwood, Illinois. Their dad worked for Baxter Laboratories in Ohio then in Maryland. Dottie graduated from North Caroline High School in Ridgely, Maryland and the family moved to Illinois in the early 1980's. She attended Carl Sandburg College in Galesburg and graduated from Blackhawk College in Moline in 1995 with a with an associates in applied science Physical Therapist Assistant. She started working before college at the Monmouth Hospital as a Physical Therapy Aide under the direction of Mr. Saddoris and later Mr. Werner. That is where she chose her direction for college as she appreciates the positive influence they had on her life. She also had experience working at St. Mary's Hospital in Galesburg and the Burlington Medical Center. 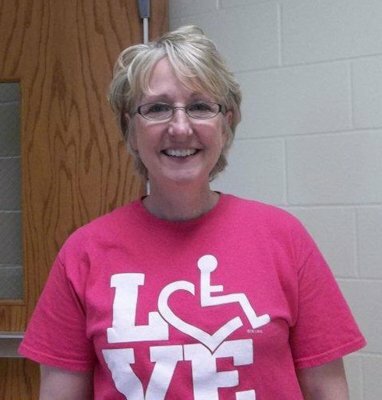 Dottie has been a Physical Therapy Assistant with the West Central Illinois Special Education Co-op since 1996, so she has been doing this for seventeen years. The co-op home office is in Macomb under the direction of Leyona Wiley. The job plan is one hundred eighty days per year and Dottie visits schools that include Bushnell, Dallas City, Nauvoo, LaHarpe, West Central and West Prairie. She loves her job and recognizes the need to help keep all children physically fit so they will get the most from their education. Dottie was chosen second runner up in the Teacher of the Year contest which is sponsored by the Iowa Hawkeye newspaper. Carrie Sheetz, a Dallas City art teacher was the first runner up, and Jacob Davis, band teacher at the Aldo Leopold School in Burlington won the top honor. Dottie met her husband Mitch at Axline Pharmacy in Monmouth where they were both working after her family moved back to town. Her cousin Joy (Galusha) Miller, also employed at Axlines, introduced them and they have been best friends since then. They were married April 20th, 1985. Mitch graduated from Monmouth College and is Coordinator of the Testing Center at Carl Sandburg College in Galesburg. Mitch and Dottie have long been volunteers and coaches for the local Special Olympics competitions. They do fund raising for Warren County. They also volunteer on the District and State level for Special Olympics. There is a three day competition this summer in Bloomington and thirty-five Warren County atheletes are competing. Mitch also participates in the fund raising Polar Plunge at Lake Storey in Galesburg every year, and they both have volunteered at the Jumers Polar Plunge in the Quad Cities. They both benefit Special Olympics. Mitch and Dottie have two children. Gina is employed at Warren Achievement Industries and she is engaged to marry Jeremy Raymond who is a detective for the Warren County Sheriffs Department. Andrew is two years younger than his sister and works at HyVee Grocery Store in Galesburg and also the Bean Hive coffee shop in Galesburg. A favorite vacation destination with the kids is Wisconsin Dells and last year they traveled to Laguna Hills, California with Mitch’s brother Doug and his wife Sue. Dottie enjoys reading and flower gardening, and the family has two pets. Their dog is Bear, a toy Austrailian Shepherd and they have a cat named Max. They are members of the First United Methodist Church in Monmouth and she is a member of Chapter LE of PEO. She very much enjoyed the Monmouth Junior Womens Club in the 1980s and 1990s. Dottie says the near future includes the wedding planning for Gina and Jeremy and the Special Olympics Activities in Bloomington and they are really looking forward to their summer.